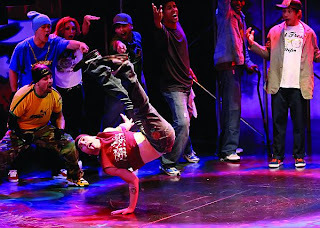 Marlyn: GROOVALOO is a group of young people expressing themselves through freestyle dance. Although each story is different, the characters are connected by the desire to be heard and to be who they want to be. Each character has his or her own identity and passion, which they are able to discover by accepting themselves. They use their talents to learn from their mistakes and turn them into something positive. Mitzi: It is an amazing performance. The dancers dance for laughter, tears, madness, fears and hope. They create their dreams through movement. It is incredible how someone can express every little part of life by dancing. GROOVALOO uses dance as communication between body and soul, to express what is too complicated for words. Marlyn: The characters show us that in life, nothing can come easily. There will always be challenges and tough choices. Many of the people around us might not agree with the things we believe in and that is always going to affect us and create obstacles, but we can never give up on our goals because they are our spirit. We were born with this spirit and it makes us unique. We should fight against the barriers and negative voices that are trying to bring us down. Mitzi: The message of the show is dare to dream. No matter what, you should never give up on your dreams. Marlyn: The energy is so contagious that you want to dance with them onstage. Mitzi: The flips, the coordination, every detail of GROOVALOO is spectacular. I learned that dance is like someone’s pulse, heartbeat and breathing. It is the rhythm of life. It is the expression of happiness, joy, sadness, and even envy. Marlyn: I highly recommend GROOVALOO to teenagers because it shows us how to express our feelings and envision the talents and strengths that we have. We all have our own story, and admitting it without shame is a way to heal many of the things that have been hurting us. It is important for teenagers to learn how to step up and seek the things we want.